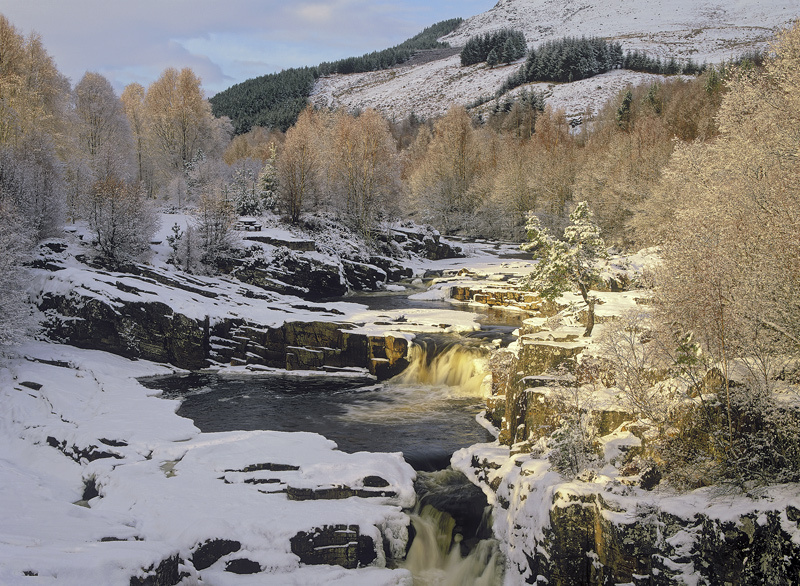 Just after the tiny village of Garve on the Ullapool road there is a foot bridge where a peaty river tumbles over a series of connected pools and cascades before continuing on its way past Garve and into the loch beyond. Whilst it is very pleasant it is not an easy subject to deal with photographically. Fortunately a good dollop of snow has the habit of covering masking the unwanted complexity and bounces light into the darker corners. It has to be said that I still wouldn't have expended a frame of film if it hadn't been for a solitary shaft of sunlight illuminating the single Scots Pine and that bare birch canopy beyond with a delicate brush of butterscotch colored light.